Humayun Ahmed (born 1948) is the most famous contemporary Bengali fictionist and playwright who has been writing for over thirty five years. He, formerly a professor of Applied Chemistry at the University of Dhaka, Bangladesh is now a full-time author and movie-maker. Towards the end of 20th century, Humayun Ahmed emerged as the most popular novelist and story-writer of Bengali literature since Sharatchandra Chattopadhya. At least for the last two decades, Humayun Ahmed's books are topping the best sellers list by a big margin. He has also achieved unparallel success as a playwright since he started writing screenplays for television in late 1980s. In early 1990s, he entered the movie-world and proved to be a successful filmmaker in spite of clear departure from traditional Bangladeshi movies. Although his novels and stories frequently build around urban middle-class life, his focus on rural Bangladesh is not negligible at all. Humayun Ahmed often shows a fascination for creating stories around supernatural events. Also, he is considered the father of modern Bengali science fiction having to his credit a number of science fiction books that he has published since 1980s. As an author, he essentially belongs to the genre whose style is characterized by magic realism. In a popular survey conducted by the BBC, Humayun Ahmed was elected as one of the ten great living Bengalis. Humayun Ahmed was born in 1948 in Kutubpur of Mymensingh district in the then East Pakistan, now Bangladesh. It is through him that the colloquial language of rural Mymensingh found a permanent seat in Bengali literature. His father Foyzur Rahman, a police officer and literature aficionado, was killed by the Pakistani army during the liberation war of Bangladesh in 1971. Small wonder that the behaviour and attitude of police officers of Bangladesh often feature in his stories and novels. Ahmed's younger brother Muhammad Zafar Iqbal who is a university professor is also a writer of children's books and science fiction. Recently Iqbal has also earned reputation as a newspaper columnist and a human rights activist. Their brother, Ahsan Habib, is the editor of Unmad and a cartoonist as well as popular writer. Humayun Ahmed married Gultekin in 1973 who gave him five children. They divorced in 2005 as Humayun Ahmed decided to marry Shaon, a young actress, who has appeared in a number of his TV dramas and movies since early 1990s. The affair with Shaon since mid-1990s, eventually culminating in wedlock, fetched Humayun Ahmed a huge criticism from the people, specially the womenfolk of the country. Humayun Ahmed attended Chittagong Collegiate School and Bogra Zilla School for his secondary education. For his higher secondary education, he attended the Dhaka College. He received excellent scores in Secondary School Certificate (SSC) and then he obtained second position in combined merit list of Higher Secondary Certificate (HSC) examination of the Dhaka Board. After graduating from the University of Dhaka with excellent grades, Humayun Ahmed joined the department of chemistry in the same university as a lecturer. He obtained his PhD. in polymer chemistry from the North Dakota State University under the guidence of professor Joseph Edward Glass. Professor Dr. Humayun Ahmed retired from the Department of Chemistry of the University of Dhaka for the sake of writing and film-making(according to his novel Chobi Bananor Galpo). Notably he is an honorary fellow in writing at the University of Iowa. Humayun Ahmed had a meteoric rise in Bangla literature. His first novel, Nondito Noroke (tr: In blissful Hell by Mohammad Nurul Huda), written while he was still a student of University of Dhaka, gained immediate popularity and critical acclaim. Equally successful was his second novel, Shankhanil Karagar (tr: The Conch-blue Prison), later made into a successful film by Nasiruddin Yusuf. Humayun Ahmed went on to become one of the most prolific writers in Bengali literature, having published around one hundred and fifty novels to date. Along with his more traditional novels and short stories, Humayun Ahmed is often credited with creating or maturing many literary genres in Bangladesh. The rise of Bengali science fiction can almost solely be attributed to Humayun Ahmed and Muhammed Zafar Iqbal, his younger brother. His contribution to the comic genre is also considerable. His televised drama Bohubrihi was one of the most successful productions of the national TV of the country called Bangladesh Television. Its characters are still household names twenty years later. The drama combined a subtle comic wit with a social message, as did his successful comic essay collection Elebele. Humayun Ahmed later developed Bohubrihi into a novel. Though set in the realities of middle class life, Humayun Ahmed's works display a particular penchant for the mysterious and unexplained. He himself and his literature are often referred to as "moon-struck", and references to the full moon in his prose are numerous. In almost every one of Ahmed's novels, there is at least one character who possesses an extraordinary milk of kindness-a characteristic of Humayun Ahmed's writing. Also, he is prone to create funny characters through which he reveals social realities and passes on his message. Another recurring theme in Ahmed's literature is the liberation war, which affected him deeply. His father was executed by the Pakistan Army during the liberation war of Bangladesh in 1971. He, along with his mother and siblings, had to hide to survive. Humayun Ahmed has made a play titled 1971, several novels like Aguner Parashmoni (The Touchstone of Fire), Shyamal Chhaya (Green Shadows) and a recent novel named Jochhna O Jananir Galpo (The Tale of Moonlight and the Mother) based on the Liberation War. The novel Jochhna O Jananir Galpo has already received huge popularity and critical acclaim. His comic novel Bahubrihi ends with the character named Farid training parrots to say Tui Rajakar (tr. you are a traitor), with the goal of sending these parrots to Bangladeshi collaborators during the war, and this gained a huge popularity among the people of Bangladesh. Dr. Humayun Ahmed wrote a notable book on 'quantum chemistry'. This book is named as "Quantum Rosayon". In this book he has represented the complicated theories of quantum chemistry. Humayun Ahmed has transformed himself into a prominent film and television personality. His first television drama, "Ei Shob Din Ratri" (Story of our daily life), gained unparallel popularity in the mid-eighties. He followed this with the comedy series "Bohubrihi", the historical drama series "Ayomoy", and the urban drama series "Kothao Keu Nei" (Nobody Anywhere). The last one featured an idealistic gang leader named 'Baker Bhai', who is wrongly convicted, and executed. Baker Bhai became such a popular character that before the last episode was aired, people across the country brought out processions protesting his death sentence. Funnily enough, public prayers and death anniversaries have been observed for this fictional character by Humayun-fans. Last but not the least, "Nakshetrer Raat" (tr. The night of stars, a long serialized televised drama was another hit that explored many facets of modern human life and relationship. Ahmed explored the film industry both as an author and director. He directs films based on his own stories. His first film, "Aguner Parashmoni", based on the Bangladesh Liberation War, received critical acclaim and won the National Film Award in eight categories, including Best Picture and Best Director. The theme of the Liberation War often comes across in his stories, often drawing upon Ahmed's in-depth memories of that war. Ahmed's film Shyamal Chhaya received an Oscar nomination for best foreign language film. It was an entertaining moview with a storyline around the war of liberaiton war of 1971. The movie portrayed a realistic picture of the liberation war without malice and prejudice. Shaymol Chhaya has proved to be a captivating movie. In our polarised world where portraying practising Muslims negatively can bring international accolade very easily, Humayun Ahmed didn't take advantage of the situation. Instead of exploiting that sick anti-Muslim sentiment, he preferred to illustrate a story that is unarguably very close to reality. 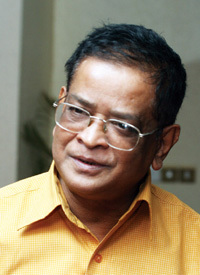 Humayun Ahmed has received considerable criticism from the literary critics of the country. One of the most common one leveled against him is that the quality of his work has deteriorated after he gained popularity and started writing for money at the request of his publishers . His brother Muhammed Zafar Iqbal once said "Humayun Ahmed has a great camera, but he only takes picture of birthday parties", referring to his brilliant prose but allegedly trivial subject matters. The main criticism was that he was repeating the same theme and structure time and again for decades. However, from 2003, he is writing more serious and information-containing novels. Some also criticize his decision to resign as a Professor of University of Dhaka to become a full time writer-film maker. But as he is considered as one of the most popular Bengali writers, his career as a professor of chemistry is blurred and he claimed that more time is needed to write and direct movies in the black era of Bengali films. Misir Ali, the character of Humayun Ahmed, a very intelligent lonely professor of Psychology of the University of Dhaka unveils secrets.